It’s the short, wide branch of the subclavian artery. 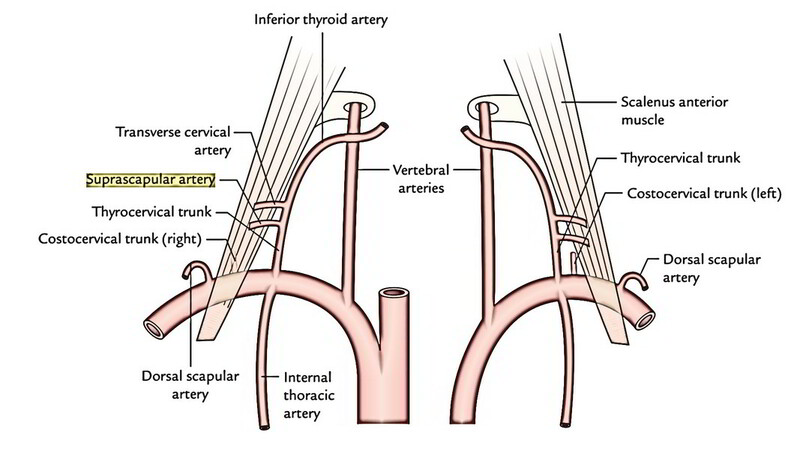 The thyrocervical trunk originates from the upper aspect of the initial part of the subclavian artery in the medial margin of the scalenus anterior and lateral to the origin of vertebral artery. It instantly ends into 3 branches. 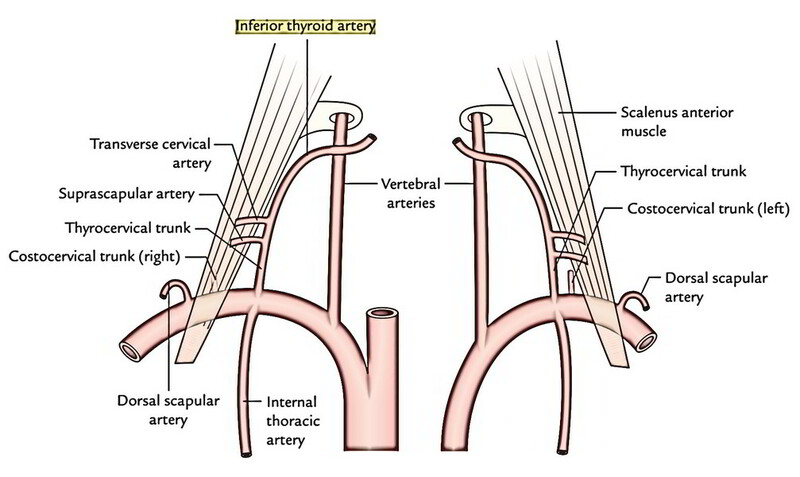 It ascends along the medial border of scalenus anterior and just below transverse process of C7 vertebra, it turns medially in front of the vertebral artery and posterior to vagus nerve, sympathetic trunk and common carotid artery to get to the posterior surface of the lateral lobe of the thyroid gland Then it descends to the lower pole of the thyroid lobe and splits into ascending and descending glandular branches. Ascending cervical artery enters upwards in front of the transverse processes of cervical vertebrae along the medial side of the phrenic nerve and acts as a guide to this nerve. It supplies prevertebral muscles and sends spinal branches to the vertebral canal along the spinal nerves. 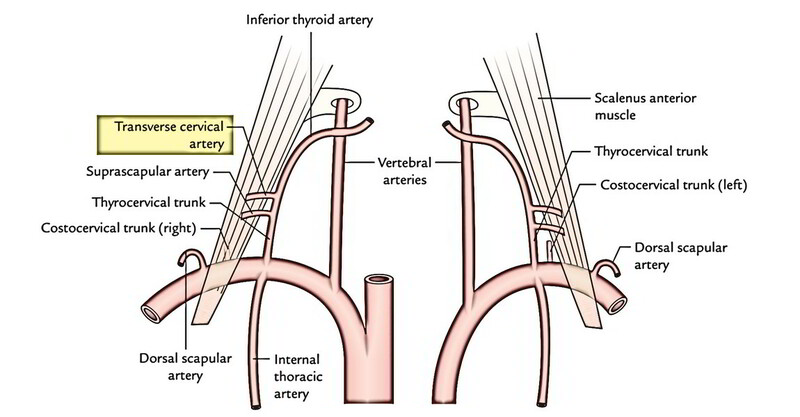 Inferior laryngeal artery accompanies the recurrent laryngeal nerve to the larynx and supplies the mucous membrane of the larynx below the vocal cord and muscles of the larynx. Tracheal, pharyngeal and esophageal branches to trachea, pharynx and esophagus, respectively. It enters laterally and upwards across the scalenus anterior to get to the posterior triangle, where it is located in front of the trunks of the brachial plexus. Here, it further divides into superficial and deep branches. The superficial branches ascend underneath the trapezius and anastomoses with the superficial section of the descending branch of the occipital artery. The deep branch lessons deep to the levator scapulae and takes past in the scapular anastomosis. 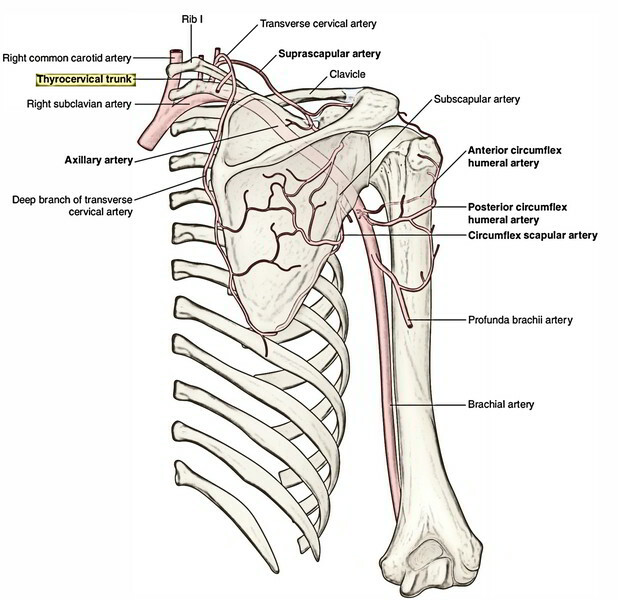 It enters laterally across the scalenus anterior to be located in front of the 3rd part of the subclavian artery and of brachial plexus. Now it enters behind the clavicle to reach the suprascapular notch of the scapula, where it enters above the suprascapular ligament to goes into the suprascapular fossa and takes part in the formation of arterial anastomosis around the scapula.